I suppose someone not in love with books might think tragedy too strong a word for the destruction of inanimate objects, but those of us who know that books have souls understand. I remember the rejoicing when the many of the medieval books in Timbuktu made their way from family libraries into the new national buildings, especially the new state of the art library of the Ahmed Baba Institute, in 2009. Now we learn of the burning of two libraries, one of them the Institute, by fleeing Islamist insurgents in the flighting in Mali. A National Geographic article, The Telltale Scribes of Timbuktu, by Peter Gwin from January 2011 is well worth reading for its evocation of place and explanation of the importance of books in the city. There is also an excellent photo gallery. Here is an excerpt. Haidara is one of Timbuktu's preeminent historians. Haidara is a man obsessed with the written word. 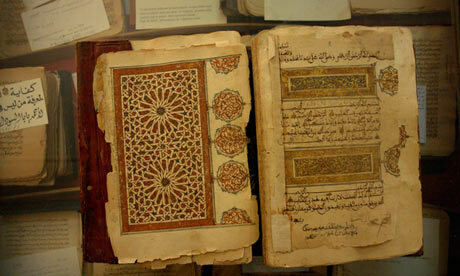 Books, he said, are ingrained in his soul, and books, he is convinced, will save Timbuktu. Words form the sinew and muscle that hold societies upright, he argued. Consider the Koran, the Bible, the American Constitution, but also letters from fathers to sons, last wills, blessings, curses. Thousands upon thousands of words infused with the full spectrum of emotions fill in the nooks and corners of human life. "Some of those words," he said triumphantly, "can only be found here in Timbuktu." It is a practiced soliloquy but a logical point of view for a man whose family controls Timbuktu's largest private library, with some 22,000 manuscripts dating back to the 11th century and volumes of every description, some lavishly illuminated in gold and decorated with colorful marginalia. There are diaries filled with subterfuges and plots, as well as correspondence between sovereigns and their satraps, and myriad pages filled with Islamic theology, legal treatises, scientific notations, astrological readings, medicinal cures, Arabic grammar, poetry, proverbs, and magic spells. Among them are also the little scraps of paper that track the mundanities of commerce: receipts for goods, a trader's census of his camel herd, inventories of caravans. Most are written in Arabic, but some are in Haidara's native Son­ghai. Others are written in Tamashek, the Tuareg language. He can spend hours sitting among the piles, dipping into one tome after another, each a miniature telescope allowing him to peer backward in time. The mosaic of Timbuktu that emerges from his and the city's other manuscripts depicts an entrepôt made immensely wealthy by its posi­tion at the intersection of two critical trade arteries—the Saharan caravan routes and the Niger River. Merchants brought cloth, spices, and salt from places as far afield as Granada, Cairo, and Mecca to trade for gold, ivory, and slaves from the African interior. As its wealth grew, the city erected grand mosques, attracting scholars who, in turn, formed academies and imported books from throughout the Islamic world. As a result, fragments of the Arabian Nights, Moorish love poetry, and Koranic commentaries from Mecca mingled with narratives of court intrigues and military adventures of mighty African kingdoms. As new books arrived, armies of scribes copied elaborate facsimiles for the private libraries of local teachers and their wealthy patrons. "You see?" said Haidara, twirling his hand with a flourish. "Books gave birth to new books." And here: a 2009 Time magazine article about the Ahmed Baba Institute by Vivienne Walt. I have not been able to find the photographer for the top image but the other two were by Brent Stirton. The loss of these ancient works of art to an act of cultural barbarism by extremists reminds me of the horrific destruction of the Buddhas of Bamiyan by the Taliban in Afghanistan. Except in this case, the Muslim insurgents ended up destroying a valuable part of their own history. Perhaps there are collectors across the world who own some of Timbuctu's books and can help to partially restore the library. Tragedy, yes.. ugh. That last image is so beautiful. Small, golden, ancent treasure against indigo, just amazing. Look at those patterns! The photos you posted are fantastic! Makes me want to cover some old books of my own! Thank you for taking the time to write about this atrocity. Like Nancy above, I immediately thought about the Buddha's at Bamiyan and the disappearance of great cultural treasures from the face of our earth. Your careful detailing of this Haidara's love for books went straight to my heart.